Challenging the conventional wisdom about gender and U.S. politics. Renowned researchers and writers Jen Lawless and Richard Fox bring groundbreaking research on gender and politics into the undergraduate classroom. 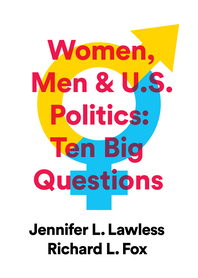 In this brief, accessibly written text, the authors focus on the big empirical questions that animate the study of gender and politics and ask students to think critically and analytically about these often surprising findings. Jen Lawless and Richard Fox are synonymous with the contemporary study of women and gender and politics. In their first textbook focused squarely on an undergraduate audience, they present their own research (some original to this book) in addition to that of other scholars and ask students to grapple with the sometimes counterintuitive findings. Lawless and Fox encourage students to think analytically and critically about the big questions that drive the field of gender and politics. Their ten brief chapters keep students focused on the big questions and the evidence political science uses to answer them.